Doha, The Indian pair of Sanave Thomas and Rupesh Kumar made it to the quarterfinals of the men's doubles badminton of the 15th Asian Games here Thursday. 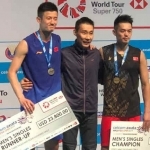 They defeated Yohan Wiratama and Susanto Njoto of Hong Kong by a score-line of 26-24,21-17 in the pre-quarterfinals at the Aspire Hall. In the other pre-quarterfinals, it was bad news for India, as Valiya Diju and Srinivas Vidyadhar went down 16-21, 14-21 to Jae Sung Jung and Dae Lee Yong of South Korea. Thomas and Kumar will now face Markis Kido and Hendra Setiawan of Indonesia in the quarterfinal later in the evening.